We are happy to welcome a new archivist to the UJA-Federation of New York Archives Project, Heather Halliday. Before becoming a member of the project, Heather was the Photograph and Reference Archivist at the American Jewish Historical Society. With her formidable experience working with visual materials, we will soon be able to bring in portions of the unprocessed collection that we anticipate will have a high concentration of photographs and rely on her expertise to guide our processing and handling of photographs found in the collection. Reynold Levy, whose oral history is included in Federation’s collection of oral histories, is featured in this morning’s New York Times. The Times article features Levy’s extraordinary fundraising skills during his tenure at Lincoln Center. Before this phase of his career, of course, he was important to Federation as Executive Director of the 92nd Street Y, one of the agencies funded by Federation. And before arriving at the 92nd Street Y he worked closely with Sanford Solender, who readers of this blog may remember as Federation’s Executive Vice-President from 1970-1981. 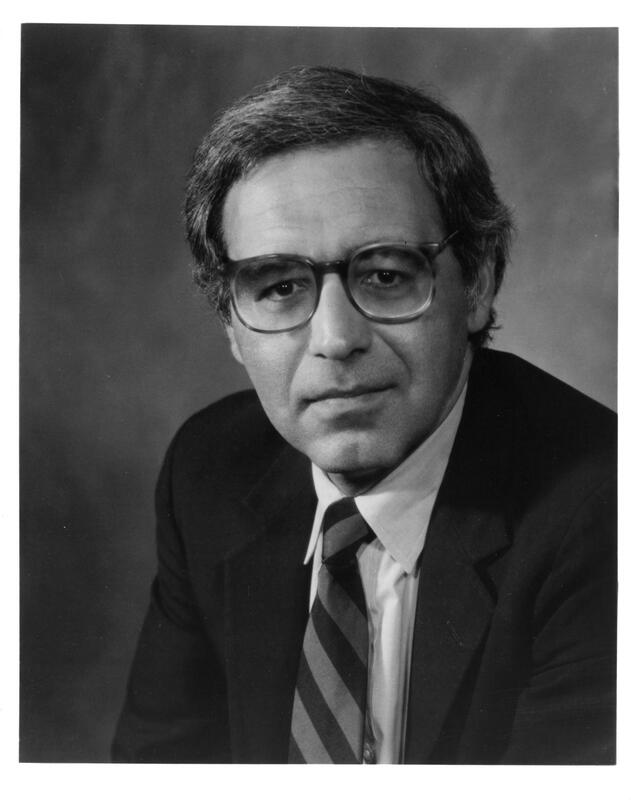 During the two years in the mid-1970s when New York City’s fiscal crisis was at its peak, Solender was simultaneously the chairman of the Community Council of Greater New York’s Task Force on the New York City Crisis. Levy was the Staff Director of the task force, and the two corresponded and met regularly. Levy’s memories of Solender in his oral history give a vivid picture of the kind of man Solender was during his Federation years. In the near future we plan to begin work in earnest on the Community Services Division files. This material is expected to contain the files of the Federation professional staff in charge of every aspect of agency business. Included among these staff members should be Martha Selig, Jack Ukeles, Donald Feldstein and others. 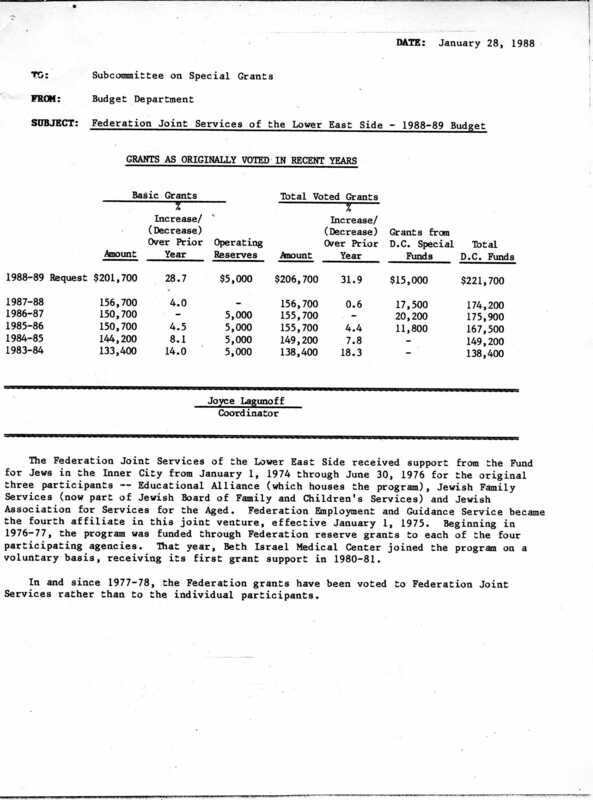 The following document was found in the Budget Department files, because they received this memo from Jack Ukeles when he was Executive Director of the Community Services Division. 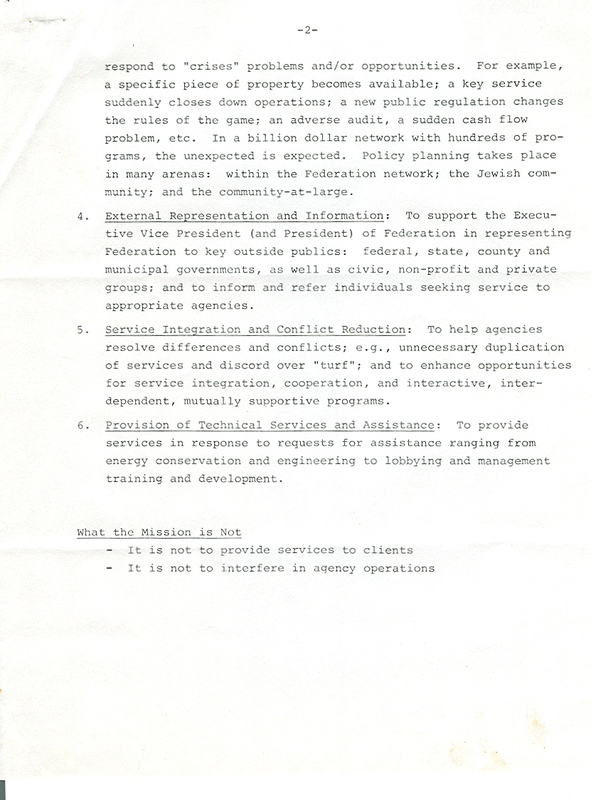 Written in 1983, the memo requests that each department within his division submit a departmental mission statement. To start the process, he distributed the mission statement for the division. Perhaps when we get to Jack Ukeles’ files (9 boxes are listed under his name) we’ll find all of the departmental mission statements. We may be able to use this mission statement to help craft our historical note about the division as an aid to researchers. And although by 1986 Federation had merged with UJA, the work performed by this division had to continue in some form and may have retained the form and functions developed by Federation. 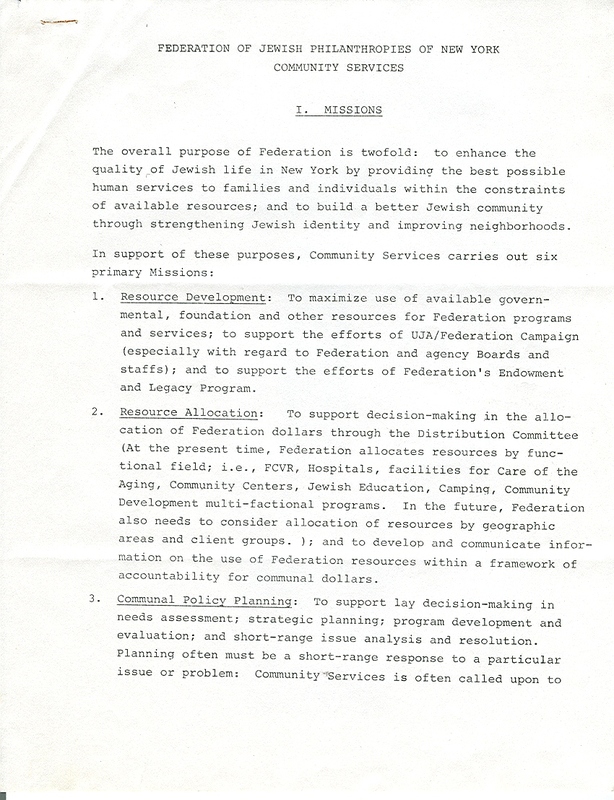 We’ll know more when we see the Community Services materials in the coming months, perhaps 300 boxes or more, and when we get to the files of UJA-Federation from 1986 to 2000 sometime next year.